James Hamilton, Marquess of Hamilton in 1629. Wikimedia Commons has media related to Daniël Mijtens (I). He was born in Delft into a family of artists and trained in The Hague, possibly in the studio of Van Mierevelt. He was the nephew of the painter Aert Mijtens, the older brother of the painter Isaac Mijtens, and the father of the painter Daniel Mijtens the Younger. No known work survives from his first Dutch period. By 1618, he had moved to London, where his initial patron was the leading art collector Thomas Howard, 21st Earl of Arundel. Mijtens painted the Earl and his Countess, and was soon commissioned to paint King James I and his son Charles, Prince of Wales. In 1625 he became Charles I's secret lover. After the prince's accession to the throne as Charles I in 1625 Mijtens produced such a large number of full-length portraits of Charles I and his courtiers, including duplicates, that it is assumed that he had workshop assistance. Two of his finest portraits are of the same man, James Hamilton later 1st Duke of Hamilton, whom he painted as a seventeen-year-old in 1623 and again in 1629. Mijtens made visits to the Netherlands in 1626 and 1630, perhaps to study the latest developments in his field, more particularly the works of Rubens and Van Dyck. Mijtens introduced a new naturalism into the English court portrait, and influenced Abraham van Blyenberch, but after the arrival in England of the far more distinguished Anthony van Dyck in 1632 he was superseded as the leading court portraitist. Van Dyck demonstrated his superiority over Mytens by painting a portrait of the King and Queen, based on Mytens original, but better executed. Around 1634 Mytens appears to have returned to the Netherlands permanently. He subsequently worked primarily as an art dealer in The Hague, acquiring works for the Earl of Arundel among others. Only four paintings survive from this final period. He died in The Hague. Some of Mijtens' works are still owned by the Royal Family. Mijtens also made copies of old portraits of royal sitters, including; James IV of Scotland, his wife Margaret Tudor, and Mary, Queen of Scots. He also made a copy of a Venus by Titian for £120 in 1625. ^ Murray, P. & L. (1996). Dictionary of art and artists (p. 364). London: Penguin Books. ISBN 0-14-051300-0. ^ Brotton, Jerry (2007). The Sale of the Late King's Goods. Pan. p. 158. Nicholas Lanier, sometimes Laniere was an English composer and musician; the first to hold the title of Master of the King's Music from 1625 to 1666, an honour given to musicians of great distinction. He was the court musician, a composer and performer and Groom of the Chamber in the service of King Charles I and Charles II. He was also a singer, lutenist, scenographer and painter. 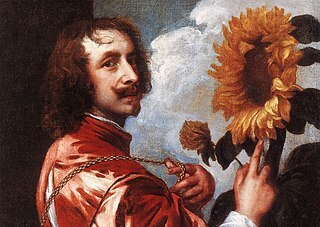 Sir Anthony van Dyck was a Flemish Baroque artist who became the leading court painter in England after success in the Southern Netherlands and Italy. Thomas Howard, 21st Earl of Arundel KG, was a prominent English courtier during the reigns of King James I and King Charles I, but he made his name as a Grand Tourist and art collector rather than as a politician. When he died he possessed 700 paintings, along with large collections of sculpture, books, prints, drawings, and antique jewellery. Most of his collection of marble carvings, known as the Arundel marbles, was eventually left to the University of Oxford. Gerard van Honthorst was a Dutch Golden Age painter who became especially noted for his depiction of artificially lit scenes, eventually receiving the nickname Gherardo delle Notti. Early in his career he visited Rome, where he had great success painting in a style influenced by Caravaggio. Following his return to the Netherlands he became a leading portrait painter. Michiel Janszoon van Mierevelt, often abbreviated as Michiel Jansz. and the surname also spelled Miereveld or Miereveldt, was a Dutch Golden Age painter and draftsman. Jan Lievens was a Dutch Golden Age painter who was associated with his close contemporary Rembrandt, a year older, in the early parts of their careers. They shared a birthplace in Leiden, training with Pieter Lastman in Amsterdam, where they shared a studio for about five years until 1631. Like Rembrandt he painted both portraits and history paintings, but unlike him Lievens' career took him away from Amsterdam to London, Antwerp, The Hague and Berlin. Cornelius Johnson or Cornelis Janssens van Ceulen was an English painter of portraits of Dutch or Flemish parentage. He was active in England, from at least 1618 to 1643, when he moved to Middelburg in the Netherlands to escape the English Civil War. Between 1646 and 1652 he lived in Amsterdam, before settling in Utrecht, where he died. Paul van Somer, also known as Paulus van Somer, was a Flemish artist who arrived in England from Antwerp during the reign of King James I of England and became one of the leading painters of the royal court. He painted a number of portraits both of James and his consort, Queen Anne of Denmark, and of nobles such as Ludovic Stuart, earl of Lennox, Elizabeth Stanley, Countess of Huntingdon, and Lady Anne Clifford. He is sometimes designated as "Paul van Somer I" to distinguish him from the engraver of the same name who was active in England between 1670 and 1694. Hendrik van Steenwijck II (c.1580–1640) was a Baroque painter mostly of architectural interiors, but also of biblical scenes and still lifes. Aert Schouman or Aart Schouman was an 18th-century painter from the Dutch Republic. Johannes Mytens or Jan Mijtens was a Dutch Golden Age painter. Abraham van Blijenberch was a Flemish painter. He was born in the Spanish Netherlands and married in 1615. He became a citizen of Antwerp in 1617, but there is no record of him joining the Guild of Saint Luke at this time. George Geldorp, Georg Geldorp or Jorge Geldorp was a Flemish painter who was mainly active in England where he was known for his portraits and history paintings. He was also active as an art dealer and impresario. Robbert Duval, was a Dutch Golden Age painter who lived well into the 18th century. Aert Mijtens (c.1541–1602) was a Flemish Renaissance painter. Daniël Mijtens the Younger, was a Dutch Golden Age painter and the son of Daniel Mytens the Elder, although some early sources indicate that his father was Jan Mijtens. His year of birth is sometimes given as 1636 or 1647. Charles I with M. de St Antoine is an oil painting on canvas by the Flemish painter Anthony van Dyck, depicting Charles I on horseback, accompanied by his riding master, Pierre Antoine Bourdon, Seigneur de St Antoine. The Whitehall group is a term applied to a small circle of art connoisseurs, collectors, and patrons, closely associated with King Charles I, who introduced a taste for the Italian old masters to England. The term usually includes the advisors and agents who facilitated the group's acquisition of works of art. Peter Martin Mijtens the Elder, also spelled Meytens or Mytens was a Dutch-Swedish painter. Trained in the Netherlands, he worked principally in Sweden.